Nigeria is endowed with arable land and fresh water resources when viewed as a whole with approximately 61 million hectares of the land cultivable while the total renewable water resources is about 280 km3/year; which include river Niger, river Benue, lake Chad, Osun river, Hadejia River, Bonny river and a host of others. Soil condition and water availability if effectively managed will help boost food production and address food crisis in the nation. 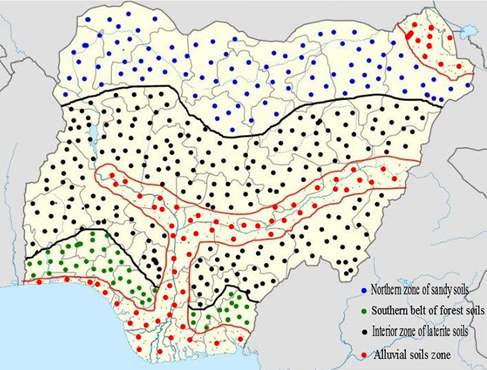 Nigeria has a wide diversity of soil under different ecological conditions and with different levels of fertility. The different soils are a function of prevailing climatic condition, vegetative cover, and topography of the area among others. The major soil types in Nigeria, according to FAO soil taxonomy legends are fluvisols, regosols, gleysols, acrisols, ferrasols, alisols, lixisols, cambisols, luvisols, nitosols, arenosols and vertisols. These soil types vary in their potential for agricultural use. None of these soils was rated as class 1 with high productivity by the FAO. Northern zone of sandy soils: This area lies in the very northern parts of the country. This area lies in the extreme north with proximity to the fringes of the fast- encroaching Sahara desert. It is characterized by soils formed by deposition of sand by the wind. These soils might have been formed from wind-sorted desert sands that accumulated over long periods of time when the Sahara desert encroached several kilometers south of its present limits. The soils of this zone are very good in the production of groundnut, sorghum, cowpea, and millet. Interior zone of laterite soils: This zone is made up of a mixture of sand and clay. They are grey to black clay, poorly drained and seasonally flooded forming the “fadama”. Soil in this zone is deeply corroded, generally sticky and impervious to water and has low fertility. When the virgin forest on them is cleared it reduces the fertility further, thus making the available soil of little agricultural value. However, not only laterite soils are found in this zone. The Biu Plateau has rich soil that is productive and offers prospects for the expansion of the areas of cotton production. Southern belt of forest soils: Soils in this zone broadly represent those of the humid, tropical forest climate zones of the south where the wet season is long, the harmattan season short and forest cover is dense. Local soil types depend largely on parent rock; where the underlying rocks are granite or clay, the soils is a rich clayey loam. These soils are very good in growing crops like cocoa, oil palm, rubber and they are of considerable importance in Nigerian agriculture. Zone of alluvial soils: These soils are found along the flooded plains of rivers, deltas, along the coastal flats. This zone extends from the coastal inland and runs along the valleys of the Niger and the Benue rivers, thus cutting across the vegetational zones. Soils in this zone are characteristic of fresh-water soil of grey to white sand, grey clay and sandy clay with humic topsoil. Another group consists of brownish to black saline mangrove soils, with a mat of rootlets. The traditional land tenure system and soil management practices involving shifting cultivation, slash –and-burn processes and traditional tillage method ensures the maintenance of soil physical properties and sustainable productivity. However, land use pressure has reduced the duration of fallow to restore soil fertility below the recommended minimum threshold required for sustainability (FAO 1985). · Cover cropping: This involves the planting of crops that help manage soil fertility, water, weeds, pests, diseases. It helps to reduce erosion, suppress weed manifestation etc. example include; Mucuna pruriens, centrosema pubescens, Pueraria phaseoloides. · Crop rotation: Alternating different crops with different nutrient requirement on a farm land in a predefined manner. It also help in replenishing lost nutrient e.g Nitrogen fixation by legumes. · Nutrient management: The use of organic manure, plant residues helps to improve the fertility of the soil and the amount of organic matter content, which also improve the soil structure and function. · Tillage: The practice of reduced tillage or no-tillage operation limits the disturbance of the soil and retains plant residues. This is very helpful on soils that are easily prone to soil erosion. Water is an important constituent of the ecosystem; it is the most abundant substance on earth. Water is an important requirement for sustainable agricultural production. Crops can be grown without fertilizers and even without soil, but they cannot survive without water. Without adequate moisture, plants cannot mobilize soil nutrients and lack of water at critical stages of development will result in stunted plant growth. Increasing population requires proportionate increase in crop production, which has suffered little output due to dependent on rainfall. To meet future food needs, farmers will have to make better use of all available moisture by employing water harvesting, conservation and efficient irrigation methods. Rainfall: Nigerian agriculture is basically rainfed, making her dependent on rain as the source of water. This is however a limiting factor defining the low productivity level. Water is therefore a limiting factor to agricultural production in most parts of the country. Rainfall patterns and distribution varies within the country with the average annual rainfall of between 1000 – 2000 mm in the humid areas and 500 – 600 mm in the semiarid areas. The southern part of the country experienced long raining season with thick cloud which starts in March, and last to the end of July, with a peak period in June. Also, a short dry season known as “August break” is generally observed in the last two weeks of August. The dry season lasted between late October to early march; this period witness dusty north-east winds. However, the Northern Nigeria which experience long dry season from October to mid-May, the wet season covers a relatively short period, from June to September. The rains are generally convectional, heavy and short in duration, often characterized by frequent storms. This results in flash floods and in some places also in sheet or gully erosion. Nigeria’s cultivation land has been estimated to about 71.2 million hectares but less than 50% is put to use due to water constraint.The seasonality of rainfall results in situations where water is available and often in excess at certain times, followed subsequently by periods of intense drought. Traditionally many farm families in Nigeria had cultivated small areas in fadamas during the dry season, using water manually drawn from shallow wells or streams. Major fadama areas are located along the flood plains of the Niger, Sokoto Rima, Benue and Yobe rivers. Irrigation practices in Nigeria central only on surface channeling of water from water bodies to the field, the use of precision or drip irrigation as practice in developed nations with high efficiency is yet to be recognized as a solution to water management. Despite the abundance of different sources of water for irrigation Rivers, Lakes, dams and reservoirs in Nigeria (e.g Oyan dam, Dadin Kowa dam, Tiga dam, Kiri dam and a host of others), Irrigation farming potentials has not been fully utilized which has kept Nigerian Agriculture mainly rainfed with low output. Aremu JA, Ogunwale SA (1994). Comparative Analysis of Small and Large-Scale Irrigation Schemes in Northern Nigeria in AO Sanda, SB Ayo (eds), Impact of Irrigation on Nigeria’s Environment, Fact Finders Int. pp. 165-185. All data and information provided on this site is for informational purposes only. www.agriculturenigeria.com makes no representations as to accuracy, completeness, correctness, suitability, or validity of any information on this site and will not be liable for any errors, omissions, or delays in this information or any losses, injuries, or damages arising from its display or use. All information is provided on an as-is basis.